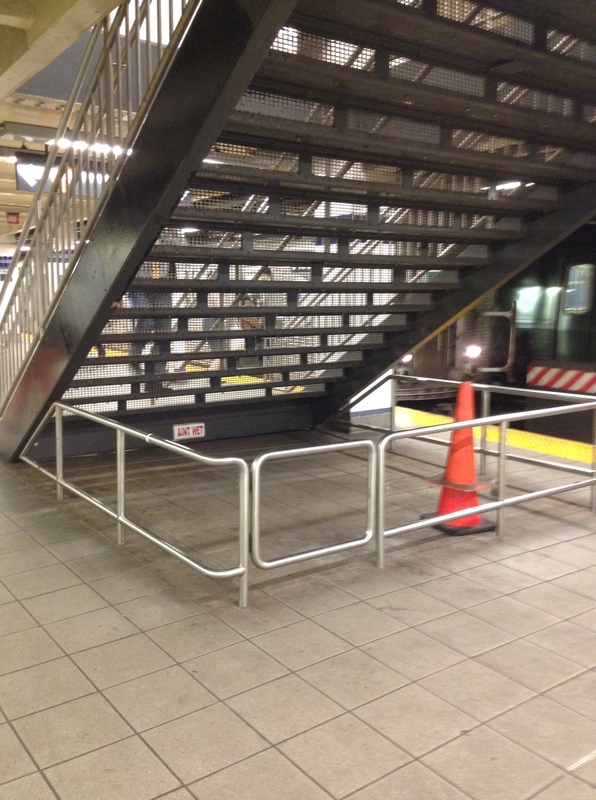 redesignAnswer: Why is the back of the subway stairs protected with an enclosure? The enclosure (or similar structure) behind this subway staircase is required by the Americans with Disabilities Act of 1990 for all public buildings and some private residences; it protects commuters with visual impairments from injuring themselves on the underside of a protruding object. In the absence of the enclosure, a blind commuter would bump into the staircase head-first before her cane made contact with an obstacle. Incidentally, it also protects those of us who walk and text simultaneously. (This does not constitute an admission of guilt on the part of the author!) Some subway stations have a storage closet built under the stairs; this station keeps it simple with a bare-minimum railing. Bonus point if you guessed the station–It is Jay St.-Metrotech on the A/C/F lines. I didn’t get this answer correct. My answer — and the answer of a lot of people — was that it is there to prevent perverts from looking up skirts or kilts. Another guess I had was that it would keep snow and ice from shoes from going through the stair case and creating slippery puddles below. Subways often have little yellow bumps at the edge of the platform (seen toward the right above) to help the visually impaired. This is called tactile paving. One of the goals of redesign mobile is to push for the design of products for people of all abilities. Victor got this answer immediately. As the father of an autistic child, he’s especially passionate about designing products for people of all abilities. Previous Post redesignQuiz: Why is the back of the subway stairs protected with an enclosure? Next Post redesignQuiz: Why is the tab torn on this cable I purchased from Walgreens?